Following a predominantly serial-structured, cliffhanger-based first half to the series, the six episodes comprising the second half of Series 6 are surprisingly standalone affairs, without a single serial between them. The TARDIS takes the Doctor and his companions from present-day Leadworth to Berlin in the 1930s, where they must deal with a mission summed up by three words: Let’s Kill Hitler...! Unlike many episode guides, I do not regard Let’s Kill Hitler as the second part of a two-part story. For me, the separation of period, place, subject and tone mean that this is not a direct continuation of A Good Man Goes to War. Sure, we’ve had changes of location and even time between serial episodes before (for example, the passage of a year between The Sound of Drums and Last of the Time Lords) but here it seems that a much greater duration has elapsed for the Doctor (Matt Smith) while he tried - and failed - to find the infant Melody Pond. He probably got caught up in several solo adventures during his travels, and certainly had time to pick up a new overcoat. A reference in the next episode, Night Terrors, to the Doctor’s childhood having been “about a thousand years ago”, could indicate that a century has passed for him since A Good Man Goes to War. Thematically, the series finale The Wedding of River Song (covered later in this review), which sees the return of Madame Kovarian (Frances Barber) and Dorium Maldovar (Simon Fisher-Becker), is more of a sequel to A Good Man Goes to War than Let’s Kill Hitler is. It is true that Melody is finally located in this episode, but probably not in the way that you had expected, and certainly not in the way that Amy (Karen Gillan) and Rory (Arthur Darvill) had hoped. The introduction of Mels (Nina Toussaint-White) is brilliantly conceived. When the flashy sports car crashed into the scene during the teaser, I was sure it would be River Song who exited the vehicle. I was wrong... and yet I was right, because not long afterwards Mels (short for Melody) regenerates into Alex Kingston. Prior to this transformation, it seems perfectly possible that Mels has been written in as a new companion. Toussaint-White’s age fits the general companion type, and at the time rumours were rife that Amy and Rory would be written out later in the series. Tonally, this episode could scarcely be more different from its predecessor, despite being penned by the same writer, Steven Moffat. The first half of A Good Man Goes to War is characterised by triumph over adversity, which gives way in the second half to a sense of foreboding. By contrast, Let’s Kill Hitler provides light-hearted anarchy - despite the presence of Nazis and the fact that the Doctor faces a surprisingly early death. The lack of Hitler (played briefly by Albert Welling) has been a sticking point for some critics, but for me this is part of the fun. The episode quickly shifts its focus to the absurdities of the Teselecta (such advanced technology, yet the crew can’t even get the year right - or Rasputin’s skin colour) and the eccentricities of the newly regenerated River. I did wonder whether Hitler would reappear, alongside Ian McNeice’s Churchill, in The Wedding of River Song, but it was not to be. (Still, there’s always Series 7...) River’s taunting of the Nazis, “Well, I was on my way to this gay gypsy bar mitzvah for the disabled, when I suddenly thought, ‘Gosh, the Third Reich’s a bit rubbish. I think I’ll kill the Führer,’” reminds me somewhat of Laura Solon’s hilarious “Lady from the House” character from her radio show Talking and Not Talking. Good times, I love it! The first disc of this two-disc set also includes a nine-minute Monster Files featurette on the realisation of the Teselecta’s Antibodies. Let’s Kill Hitler is certainly silly, but in a good way. Night Terrors was originally scheduled to be broadcast as the fourth episode of Series 6, but effectively switched places with The Curse of the Black Spot in order to provide a greater variety of stories during the first half of the series. Unfortunately, this episode’s relocation had led to some repetition during this second half. Sinister dolls feature here, in the form of human-sized peg dolls, and in The God Complex a couple of episodes later, in the shape of ventriloquist’s dummies. In common with Closing Time a further episode later, writer Mark Gatiss focuses on a child’s father (in this case Alex, played by Daniel Mays), with the mother (Emma Cunniffe as Claire) appearing only at the opening and closing of the episode. Perhaps the production team felt that one parent works better than two in terms of storytelling, but wished to avoid the cliché of actual single parents, having depicted them several times in the show in recent years - for example, Jackie Tyler throughout Series 1 and 2, Nancy in The Empty Child / The Doctor Dances, Trish in Fear Her, the Doctor himself in The Doctor’s Daughter, and Captain Avery in The Curse of the Black Spot. It’s interesting to observe how the spotlight has shifted from mothers to fathers over time, as though to acknowledge the rights and responsibilities of the male parent in today’s society. Though it starts out like Fear Her (a lone parent whose troubled child possesses a dangerous imagination), it ends up being more like the Star Trek: The Next Generation episode Future Imperfect (there’s a reality-bending alien cuckoo in the nest). One wonders what fan speculation would have arisen surrounding possible connections between the nature of George (Jamie Oram) and Amy’s seemingly impossible pregnancy had this episode gone out earlier in the year. However, what lingers in the memory is plenty of scares from the creepy peg dolls, a typically Moffat-era menace. The next episode, The Girl Who Waited, also goes where Star Trek has boldly gone before. Both the Deep Space Nine episode Children of Time and the Enterprise episode E² deal with the moral issue of erasing a person’s timeline in order to save another. For me, the Star Trek examples are more poignant because they deal with the descendents of the “present day” characters - actual different people, who will never be born if the timelines are changed. (Those episodes also explain their time shifts more clearly than The Girl Who Waited does.) All that is at stake in this episode is the fate of one of two possible futures for Amy Pond. Either way, one version will survive, and surely Amy will have a better quality of life if the younger version is retrieved from the Two Streams Facility. That’s my coldly logical analysis of the dilemma. On an artistic level, however, it’s quite another matter. In contrast with other recent episodes of Doctor Who, which tend to lose their way towards the end of the story (such as Night Terrors) and/or go overboard with sentimentality (such as Closing Time), what starts out as a fairly abstract moral problem solidifies into a truly emotional experience as Rory and the older Amy converse through the barrier of the closed TARDIS doors. The final scenes of The Girl Who Waited are worth waiting for. Like The Girl Who Waited, Toby Whithouse’s The God Complex is derivative, but does it with style. In common with George Orwell’s Nineteen Eighty-Four, each character’s room contains that which he or she fears the most. In Orwell’s book, it is called Room 101. The Doctor’s room in this episode, appropriately enough, is number 11. Amy’s is 7, after her age when she first met the Time Lord. We get to see what’s in Amy’s room (once again, Gillan skilfully portrays another age, perfectly mimicking the facial expression of Caitlin Blackwood, who briefly reprises her role as the young Amelia), but what the Doctor sees in his is left to the viewer’s imagination. We hear the TARDIS’s cloister bell, so I speculate that he witnesses his own devastated control room, with himself looking down at the broken bodies of companions he has failed to save. This also ties in with the Doctor’s final conversation with Amy, who is unexpectedly written out, with Rory, at the end of the episode (rather than at the end of the season). Following Mels in Let’s Kill Hitler, we have another potential companion in the form of Amara Karan’s Rita - though, as in several David Tennant specials, circumstances prevent her from joining the TARDIS crew. She and the Doctor exchange engaging banter, but hasn’t the Time Lord learned by now that asking someone to travel with him before the end of the episode is the kiss of death for them? The God Complex also reminds me of a couple of Sylvester McCoy stories. The hotel contains a bizarre array of characters and creatures, including the craven mole-like Gibbis (David Walliams), who would not have been out of place in Ghost Light. Both stories quote the nursery rhyme “Oranges and Lemons” - “Here comes a candle to light you to bed, / Here comes a chopper to chop off your head” - as does Nineteen Eighty-Four. In a scene that mirrors The Curse of Fenric, the Doctor makes his female companion lose her faith in him. By coincidence, the McCoy audio drama House of Blue Fire features a similarly surreal hotel in which guests are confronted by their worst fears. If you get the chance to hear it before having seen The God Complex, I recommend that you do so, for thematic reasons. The episode also contains nods to Stanley Kubrick’s The Shining, in director Nick Hurran’s shots of long corridors and close-ups of frenzied repeated writing, and of course to Classical mythology, in the form of the Minotaur (Spencer Wilding). I could have done without the reference to The Horns of Nimon. The Creature and its abilities are only vaguely similar to the Nimons, so a genetic relationship didn’t really need to be established. After all, no one felt it necessary to theorise that the Krillitanes are related to the Tetraps, despite both species resembling bats. Nevertheless, The God Complex is far from being a load of bull. Another long gap occurs between The God Complex and Closing Time. Dialogue in The Impossible Astronaut and Night Terrors suggests that about a century may have passed for the Doctor once again, with a total of 194 years elapsing between A Good Man Goes to War (in which he is aged 909) and Closing Time (in which he is 1103). This episode is a very welcome sequel to the previous year’s The Lodger, reuniting James Corden (as Craig), Daisy Haggard (as Sophie) and script writer Gareth Roberts. Haggard makes only a brief appearance, towards the beginning and end of the episode, so the real focus is on the relationship between the Doctor, Craig and baby Alfie. There’s much fun to be had as the Doctor uses his ability to “speak baby”, established in A Good Man Goes to War, to communicate with Alfie - or, as the child prefers to be known, Stormageddon Dark Lord of All! Other nods to the past include the Doctor’s comment that Craig has redecorated, but “I don't like it,” paraphrasing a line spoken by Patrick Troughton in The Three Doctors and The Five Doctors. The writer even quotes from the novelisation of Revenge of the Cybermen, with the rhyme: “Not a rat, a Cybermat.” And the department store setting echoes how new Who began back in 2005. My only criticism of this wonderful episode, apart from an overdose of sentimentality towards the end, is that the opening titles should have billed Corden rather than Gillan and Darvill, who scarcely appear. Moffat’s story arcs have been defying my expectations for so long that it actually came as a surprise when a couple of major developments at the end of this season proved to be quite predictable. It was River Song in the spacesuit! We had all tried to second-guess the identity of the “good man” that River was prosecuted for killing, but it turns out that her victim was the Doctor after all. If you think about it, it is illogical for the Silence to bother putting River, or indeed anybody, inside a spacesuit that can move by itself, but perhaps they (like Moffat) simply got caught up in fulfilling the prophecy. (The same might be said of the so-called wedding, which serves little purpose beyond providing the episode’s title.) Notably, the Eleventh Doctor faces the prospect of actual death more bravely than the Tenth Doctor faced the prospect of regeneration in The End of Time. His assertion that River won’t remember shooting him seems at first to conflict with Flesh and Stone, but ultimately the statement proves to be an erroneous guess on his part (River recalls perfectly, but pretends not to, to prevent spoilers). It’s OK, though, because the Doctor didn’t really die! It was the Teselecta all along! I had guessed that it might be, but then again I had previously guessed that it might be the Flesh (from The Rebel Flesh / The Also People) and had been proven wrong. Some critics have questioned the plausibility of the Teselecta apparently beginning to regenerate, but if it can mimic faces, hair, clothing and even a motorcycle (all of which it does in Let’s Kill Hitler) then simulating regeneration energy isn’t so far-fetched. Where The Wedding of River Song seriously wobbles is in its similarities to the end of Series 5. On a prophesied date, there is a temporal explosion. The remnants of the Earth collapse into a bubble of confused space-time. Amy forgets Rory, but ultimately remembers him again. The Doctor must be destroyed if the universe is to be saved. Still, the depiction of this twisted world is certainly entertaining, with amusing return appearances by Charles Dickens (Simon Callow) and Winston Churchill, pleasing visual gimmicks such as pterodactyls swooping over a London park, a steam train travelling through the Egyptian pyramids, a hirsute Doctor (long hair suits him), and eye patches for everyone. Amy’s revenge upon Madame Kovarian is a powerful moment, forcefully played by Gillan, a long overdue acknowledgement of the pain that she must feel as a mother who can never see her baby again. The final scene between the Doctor and Dorium indicates that the former is going to lay low for a while. This could mean less reliance in forthcoming episodes on overarching plots concerning the increasingly powerful and infamous Time Lord known as the Doctor. On the merits of the middle four episodes sandwiched between the Moffat-scripted bookends of this box set, that may be a good thing. However, it could simply herald longer gaps between episodes in 2012. 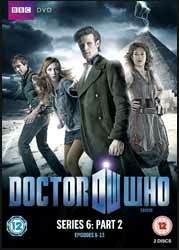 The emphasis on the question “Doctor who?” promises a back-to-basics approach, a return to the former mystery surrounding the Doctor’s identity. More ominously, Dorium’s statements also seem to be paving the way towards the Eleventh Doctor’s final days. I have enjoyed every episode of this series more the second time around, and that is especially true of The Wedding of River Song. I felt somewhat cheated the first time, but this time I am satisfied.